In September 2011, CRRC on behalf of Eurasia Partnership Foundation and EWMI G-PAC conducted a nationally representative survey on Volunteerism and Civic Participation in Georgia. 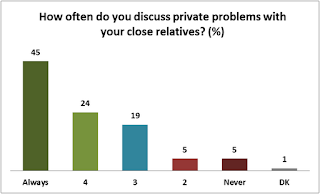 Georgians were asked how often they get together and discuss private problems and politics with their friends and relatives (who do not live in their houses). The results show that while Georgians meet their relatives and friends quite often, the frequency of political discussions among them–one of the indicators of political motivation and involvement—is rather low. 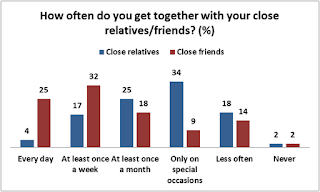 Note: The question “How often do you get together with your close friends?” was only asked to respondents who said they have close friends (92%). 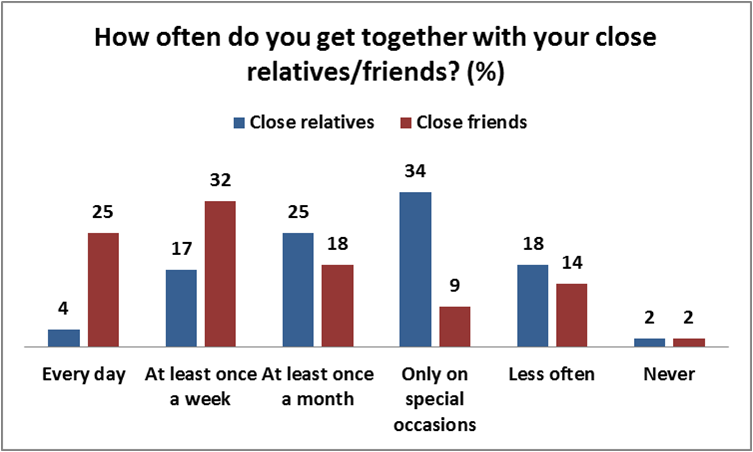 As the chart shows, Georgians meet their close friends more frequently than their close relatives; just over half get together with their close friends at least once a week and 46% meet their close relatives at least once a month. Even though the frequency of get-togethers with close relatives is lower than the frequency of meeting close friends, many Georgians are comfortable sharing their own private problems with their close relatives. 45% of the adult Georgian population always discuss their personal problems with their close relatives when they get together. Note: (1) This question was only asked to respondents who get together with their close relatives at all (98%). (2) The original ten-point scale is collapsed to a five-point scale. However, the picture changes dramatically when the question concerns politics. Over half of the adult Georgian population never discuss politics with their close friends or relatives. People in Georgia seem to prefer discussing their own private problems with their close relatives rather than politics–an issue that concerns everyone. The picture remains the same when Georgians are asked about how often they discuss politics with their friends when they get together. 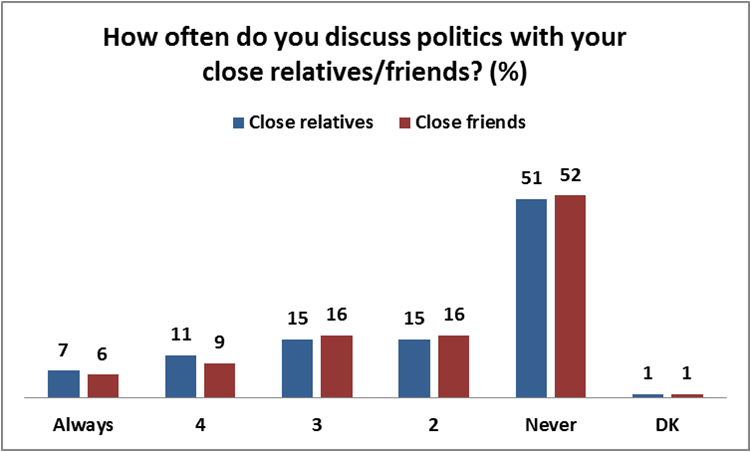 Georgians are equally reluctant to discuss politics with their close relatives and friends. This indicates that this aspect of political involvement is rather low in Georgia. 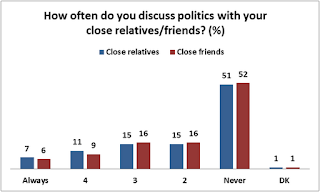 Note: (1) The question “How often do you discuss politics with your close relatives?” was asked to respondents who get together with their close relatives at all (98%). (2)The question “How often do you discuss politics with your close friends?” was asked to those who say they have close friends and get together with them (90%). (3) The original ten-point scale is collapsed to a five-point scale. To explore this issue farther CRRC asked Georgians: When you get together with your close relatives, who discusses politics more – men or women? 40% said that men discuss politics more often than women. 36% said that men and women equally discuss politics when they get together with their close relatives, and 17% said that women discuss politics more often than men. Survey respondents were also asked to indicate an age range of their close relatives who discuss politics more frequently. 45% said middle aged (those in their 40s and 50s), 27% said elderly people (over 60) and only 6% said youngsters (those in their 20s and 30s). 23% said people of any age equally discuss politics with their close relatives when they get together. These results indicate that there is a perception that middle aged men are most likely to discuss politics with their close relatives when they get together, while youngsters are less eager to do so. Discussing politics with friends and relatives is only one, yet very important indicator of political involvement that plays a crucial role in the democratization process. CRRC survey data indicate that the frequency of political discussions among Georgian relatives and friends is rather low. What are the reasons behind this result? Why people in Georgia are so reluctant to discuss politics with their friends and relatives then they freely discuss their private problems? How does such reluctance to discuss political issues affect democratization process in the country? We would like to hear your thoughts.